The Hamilton Ovens are pretty famous and they have different variations in their ovens with different features as well. 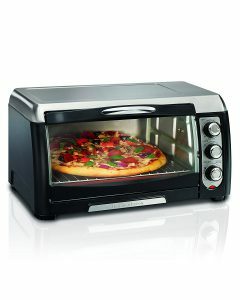 In the Hamilton Beach 31330 Toaster Oven Review you are going to see an in-depth review of a particular model of the Hamilton Oven and if it is going to be a good purchase as a countertop Pizza Oven or not! 1. Right out of the box, the main feature that is impressive about this oven is that it is well designed and is small enough to keep it on your countertop. The oven looks sleek and with all the features, it makes this oven a pretty good option for making Pizzas. 2. The Oven comes with an easy to pull out drip tray which can be easily cleaned to remove any crumbs fallout from the baked items that you put inside the oven. The Oven trays are easy to clean hence when it comes to maintenance this oven should not give you any problems. 3. The oven comes with temperature settings which vary from 150 -450 Fahrenheit. The Oven comes with a timer knob as well and you can easily time your baked goods with an automatic switch off when the timer goes off. Baking in the oven is pretty easy as the knobs settings are self-explanatory. 4. Cooking your pizza in this Oven is going to be a treat as it cooks 12 inches pizzas perfectly with a crispy base with a gooey cheese layer on top. The toppings are cooked to perfection and once the pizza is done, removing it out of the Oven is easy because of the wide window that helps you pull out the tray easily. 5. You can choose from the Bake, Broil and Toast settings on the Oven which means you use it to not only make pizzas but to toast your break and even make some baked snacks. The Oven can be used to bake frozen chicken nuggets and maybe even make some cinnamon rolls. This oven is going to be useful for making a ton of items and for the given price point it is definitely a steal. 1. Something that a few users complained about is the convention fan going off after a year of usage, so this product is definitely having some issues when it comes to being durable but even then for the given price point, I still think it is a pretty good option to go for if you need a countertop pizza oven on a budget. If you are looking for a Pizza Oven that would give you multiple features and work beautifully as a toaster as well then the Hamilton Toaster Oven is a pretty good choice. For the price point, this can be one of the best countertop pizza ovens out there. I have personally liked the oven as it can get really hot and is perfect to cook crisp pizzas. 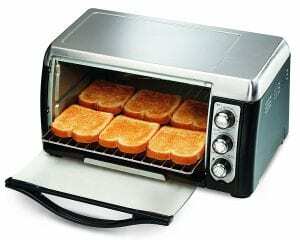 The product has only one downside and that is it can not last you very long but if you are okay with a year of pretty good service then you should consider getting this toaster oven. 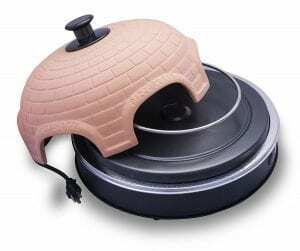 Overall it is a great investment for just $50 and if you are looking for something in the given price range then you should definitely consider this pizza Oven. If you have any experiences with this toaster oven form Hamilton then leave them in the comments section below! If you found the post helpful then do share it with your family and friends on social media! The Presto 03430 Pizzazz Plus Rotating Oven review is vital for all the Pizza lovers out there who want to make pizza at home and are looking for a really nice pizza maker that can get the job done without breaking the bank. Initially, I was a bit skeptical about this pizza maker and thought that it might not be as effective as it looks but then I did realize that this pizza maker has some really good features to offer and it is a lifesaver for someone who loves making pizzas at home. 1. 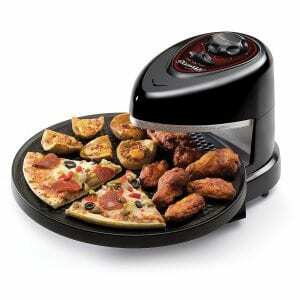 The pizza maker is really easy to set up and easy to clean as well. There is pretty much nothing you need to do when it comes to making pizza in this pizza maker. If you are going for frozen pizza then all you need to do is place it on the non-stick tray and turn on the heating elements. 2. 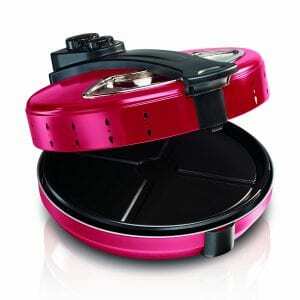 The Pizza maker has two heating elements which are the lower element and the upper element. You can choose if you want to use anyone from the two or if you want to use both of them at the same time. The best option would be to go for the dual option to get a pizza with the perfect crisp base with gooey cheese on top. 3. You do not need to preheat this like an oven and all you need to do is set the timer so that the pizza can get cooked well from the top and the bottom. Once the time on the timer runs out, you hear a sound which indicates that the pizza is done.The nonstick pan comes off so that you can easily serve the hot pizza when it is ready. 4. 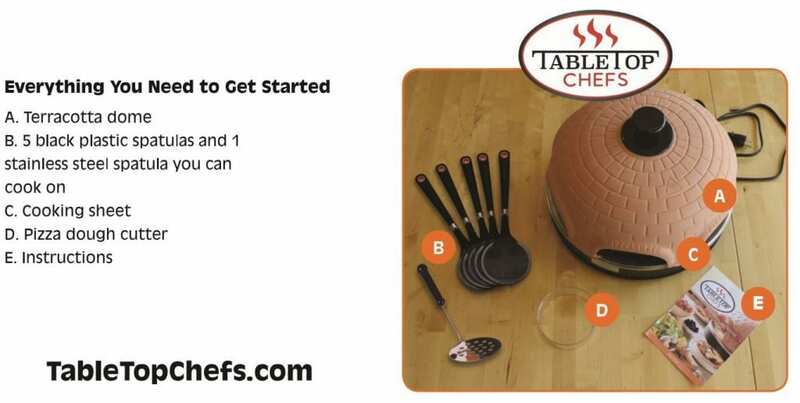 You can use this to cook other baked items as well which include frozen chicken nuggets, quesadillas, cinnamon roles and there are a ton of different possible recipes that you can experiment with this amazing pizza maker. 5. The Pizza maker can make around pizzas of 12-inch sizes which is pretty amazing. There are a few pizza makers out there that promise the size of pizza they can accommodate to be 12 inches but in reality, they work well with pizzas of much smaller sizes. 1. The pizza maker takes around 15-20 minutes which is quite some time in comparison to a few other pizza makers that promise pizza within 5 minutes. Although most of the pizza makers that promise that has their own downsides so you might want to consider that as well. 2. The pizza maker rings a bell when the timer goes off but does not stop heating so you might want to switch off the pizza maker and then remove the pan. The pizza maker does not have an ON/OFF button which is pretty odd otherwise the pizza maker is pretty good. The Presto rotating pizza maker is pretty good for anyone who is living in a hostel or who wants to make something really quick to eat and can just place a frozen pizza and get it done within a couple of minutes. This pizza maker would have really been useful during my college times and if you are working then too you would find these pizza makers pretty useful. For someone who wants to buy a pizza maker without spending way too much or if you are on a budget then this pizza maker is actually amazing and with all the amazing reviews on Amazon, I can say that the customers are pretty much satisfied with this product as well. If you have bought this pizza maker and have had any previous experiences then do let us know about it in the comments section below, we love to see people sharing their experiences. If you found the post useful then do share it on social media! Hamilton Beach Pizza maker is another simple Pizza maker and it can be one of the most affordable rotating pizza makers out there. There are a lot of good reviews about this Pizza maker on Amazon but is it really worth all the hype? The Hamilton Pizza maker does have some happy users so let’s dive into a detailed Hamilton Beach 31700 Pizza Maker review. 1. 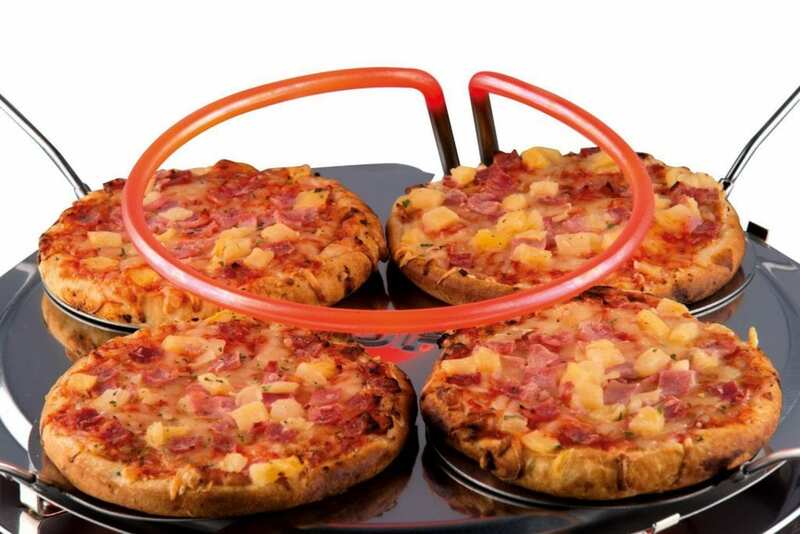 The Pizza maker has a rotating heating pan that cooks the Pizza evenly in all the directions and since the entire case is enclosed with top and bottom heating elements, it really makes cooking pizzas really fast and easy. 2. 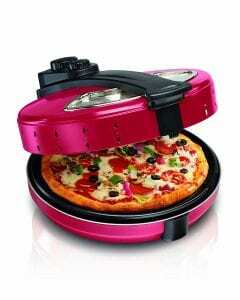 It can cook a 12-inch pizza and other snacks and baked items as well. The pizza maker has a transparent lid so you can see your pizza while it cooks inside the pizza maker. 3. The maximum time for which you can time your pizza maker is 30 minutes and once the 30 minutes are done the pizza maker automatically shuts off. Although if you are making a pizza, you might time it for a time less than that and might be able to easily cook a pizza within 10-15 minutes. 4. Another benefit with this pizza maker is that you do not need to preheat it and the pizza gets cooked once you place it inside the maker. In an oven, preheating takes quite some time and it can be pretty annoying to preheat and then again cook the pizza inside the oven. 1. Although it claims that it can cook pizzas really fast, you might want to wait it out a little longer as if you cook it for a little shorter period of time you might be left with some uncooked pizza edges. 2. The cord is a little too small, so if you have the plug far away then you might have to get creative in finding a way to keep the Pizza maker near the plug point for simply get an extension cord. 3. 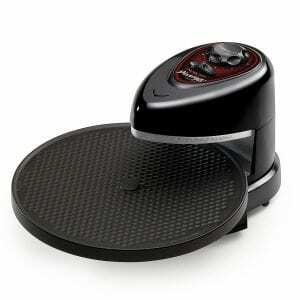 Many users who have used this pizza maker complain that it gets spoiled just within a couple of months of usage. Usually, this is the problem with a budget pizza maker that one cannot guarantee you how long they are going to last and they usually last just for a couple of months. For the given price point, I do not think one can expect way too many features from this pizza maker. It is a very simple pizza maker that you pizza in like 10 minutes. Although it is a good buy for the price point since you cannot expect anything great from it, I guess if you could spend on a Black and Decker Pizza maker, that would last you longer. There are a few other pizza makers with the same price point that you might want to consider and if you are looking to invest in a product that would last you longer then you might want to consider some higher end pizza makers that are out there. However, if you are on a budget and want to try out a rotating pizza maker then you can definitely check out Hamilton Pizza maker. If you have had any experiences with the pizza maker then do share it with our readers in the comments section below!